While flipping through worn pages of a superhero comic book, a Wonder Woman quote, wedged between colorful illustrations caught my eye. While Wonder Woman may be a fictional character, this quote reigns true amongst the many influential women in the western community. One-of-a-kind cowgirls that have influenced and elevated their communities through volunteerism, activism, art, rodeo prowess, and so much more. Women who have gone above and beyond to contribute to the western lifestyle we love and cherish. While Wonder Woman might sport a magic sword and shield, at Cowboy Lifestyle Network, our western superheroes are sporting cowboy hats and boots. In this month’s Western Industry Women highlight, CLN would like to introduce you to the “The Arizona Cowgirl,” the Wild West’s very own Wonder Woman, Bobbi Jeen Olson. A true ambassador to the western lifestyle, Bobbi Jeen Olson has been a forerunner in the world of western film, stunt acting, fashion, television hosting, modeling, and more. No doubt a Jack-of-All-Trades, Bobbi Jeen has used her success and platform as a means to actively promote faith, family, and the western lifestyle that is so special to her and her community. With such a dedication to her community, Bobbi Jeen has seen various accolades including the 2018 US Ambassador For the American Cowboy! Hailing from the Land of Enchantment, beautiful New Mexico, Bobbi Jeen has been a true-blue cowgirl from the start. With a personal connection to the ranching way of life and as an active team roper, Bobbi Jeen honed her horsemanship skills and talents. After becoming a rodeo queen, Bobbi Jeen was discovered by a talent agency and her journey into the world of western film and fashion took flight. It is through her various endeavors that Bobbi Jeen has made such a positive impact on the western community. A talented horsewoman, Bobbi Jeen has participated in various western films not only as an actress but as a stunt woman! Performing death-defying stunts from horseback is no problem for this fearless cowgirl. Some of Bobbi Jeen’s film credits include, Gunfighters of the West (1998), Deadly Sanctuary (2017), Tales of the Frontier (2012), and Walker, Texas Ranger. Currently Bobbi Jeen stars on the Cowboy Channel with her husband Jim Olson, Mother Betty Whiteley, and son Rowdy on the family-run television series, Western Trading Post TV. Depicting the day-to-day of the Olson’s very own trading post based out of Casa Grande, Arizona, Western Trading Post TV is full of history, fun, and excitement as it highlights the many Western and Native American collectibles that enter through the trading post’s doors. With a focus on keeping Western & Native American history alive, Western Trading Post TV features artists, historians, and collectors from across the country. Make sure to tune into Western Trading Post TV on the Cowboy Channel! As an active TV Host, actress, model, stunt double, mother and wife, Bobbi Jeen Olson has made an enormous impact on her community. With such a busy schedule it is hard to imagine Bobbi Jeen could fit anything more! 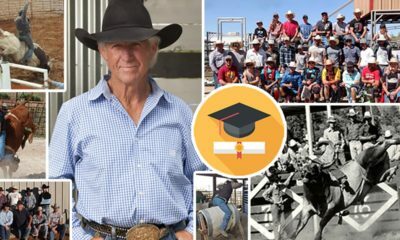 Between filming and other projects, Bobbi Jeen still makes time to mentor the young cowboys and cowgirls in her community. With a heart of gold and smile on her face, Bobbi Jeen has been a mentor to models, rodeo queens, entrepreneurs, and more. I had the pleasure of speaking with Bobbi Jeen Olson, learn more about “The Arizona Cowgirl” in this exclusive interview! Why is the Western Lifestyle important to you? You have worked with a variety of talented actors, musicians, artists. What have been some of your favorite collaborations, jobs, projects? As a stuntwoman, what have been some of your favorite stunt experiences? Cowboy Lifestyle Network is honored to feature Bobbi Jeen Olson as this month’s Western Industry Women Highlight. Make sure to follow Bobbi Jeen’s journey at her Website, Instagram, and at Western Trading Post!